DETROIT (AP) — Ndamukong Suh is looking forward to facing the Detroit Lions for the first time, giving him a chance to visit with friends and to dine at some new restaurants they have told him about. “I’ll refrain from my comments about the organization,” he said. Suh’s stay in Miami didn’t last long. 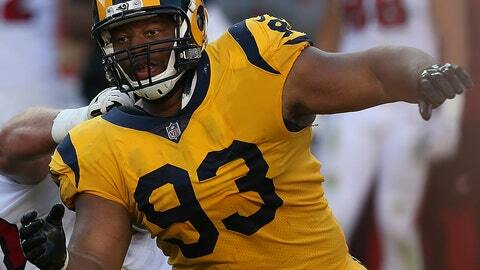 He was cut earlier this year with three years left on his contract, freeing him up to sign a $14 million, one-year deal with the Rams to play alongside star defensive tackle Aaron Donald. While Suh enjoys his homecoming of sorts, Donald will remind the Lions what they’re missing. Detroit drafted tight end Eric Ebron No. 10 overall in 2014, passing on a chance to take Donald. The Rams selected Donald No. 13 overall and he has become one of the league’s best players. Donald has a NFL- and career-high 14½ sacks, surpassing the 11 he had last season when he was the Associated Press Defensive Player of the Year. “The best part about Aaron is the first thing he’ll say is that he can always improve,” Rams coach Sean McVay said. Detroit’s defense has had a dramatic turnaround against the run, becoming the league’s only team to hold three straight opponents to fewer than 60 yards rushing this season. After ranking last in rushing defense earlier this year, the Lions are No. 14 and Damon “Snacks” Harrison seems to have a lot to do with the turnaround. Detroit acquired Harrison from the New York Giants for a fifth-round pick. “The problem is that as the season goes on, it becomes more and more difficult to stop the run,” Lions coach Matt Patricia said. Gurley has 1,043 yards rushing, trailing only Dallas’ Ezekiel Elliott. He had a touchdown in 13 consecutive games, setting a franchise record, before not scoring Nov. 19 during the Rams’ 54-51 win over Kansas City. He is expected to be healthy after having a minor ankle injury early against the Chiefs. “They say if you keep it, it’s going to keep scarring up,” Ellington recalled doctors telling him. The 5-foot-9 Ellington said he’s explosive enough to dunk a basketball and to do his job with the Lions, who signed him after they traded Golden Tate to Philadelphia. He has ended up playing an even larger role because Marvin Jones is on injured reserve. Ellington has matched his career high with six catches in each of his two games in Detroit. “They have great players on the defense, and are getting another great player back this week,” Patricia said.